Now here's a good one, musically speaking... Thematically it almost killed me with redundancy, which I'll explain, but these guys are so skilled at what they do I could ignore it, mainly because I didn't know what any of it was about until after I listened about 10 times. 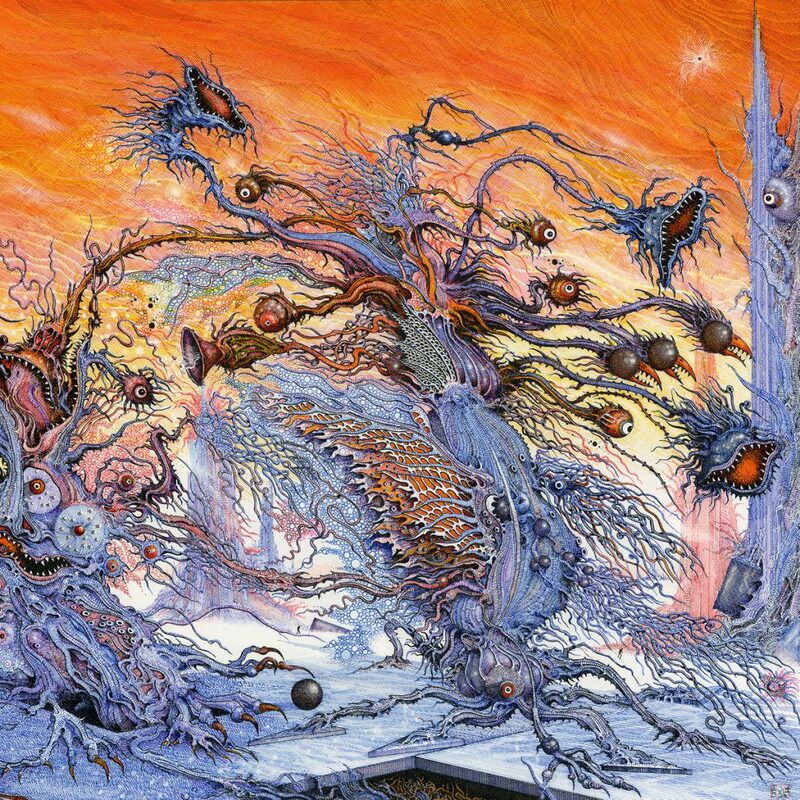 California's Ulthar are true masters of their post-death/black metal craft and the artwork by Ian Miller is visually exactly what you're about to experience. If it weren't for the theme I already hinted at, it would have been canon or close to it, easy. Cosmovore is in many ways a visual representation from the cover to the sound, but like far too many bands traps itself in something only the impure have yet to recognize as cliché. Let me be the first to openly define it as such. I keep telling the guy who runs 20 Buck Spin when I visit home I'm coming over. Maybe he'll actually open the door after reading this largely positive review, or he might punch me in the face. Cosmovore is a fine mess. There's no clear way to pin down Ulthar's style, because they mix so many genres I'll end up sounding like a hack who genre-tags his way out of a review. Patterns weave into patterns into a grotesque hybrid beast that not so much devours as it draws blood through thousands of cuts with all of its little mouths (cover art reference). It's quite spectacular how they manage to slide their fingers from chords to riffs like shedding reptilian skin. They can adapt to the changing climate of their own patterns, pulling you down into their spiraling, gaping chasm that Cosmovore burrows within. The technique and themes are so varied you can put it on repeat for days, but I have to say one thing...please why the Lovecraft thing again?! I get it, guy had some great stories, but he wasn't the only writer in that vein. Cosmovore is filled with Lovecraft references and hell, Ulthar named themselves after one of his works. Were it not for the inventive blend of style and substance and the ambiguous monstrosity on the cover the music represents, I would have scored lower here on the HPukecraft banality. Seriously, people, do you read anything else? I'd like to see an Ambrose Bierce fad in metal or something, but no more of this. Aside from that I guarantee you'll spin into the grave with this one and will probably just forget about its hang-ups like I did.